A bronze vase in the form of a length of coral with short ‘branches’ and engraved with two super-imposed circles to the front and back. The base has the two-character signature of Yasumi II. Contained within the original tomobako, inscribed Yasumi, Chudo kaiho kabin [cast bronze flower vessel in the shape of Treasure of the Sea (possibly coral)]. 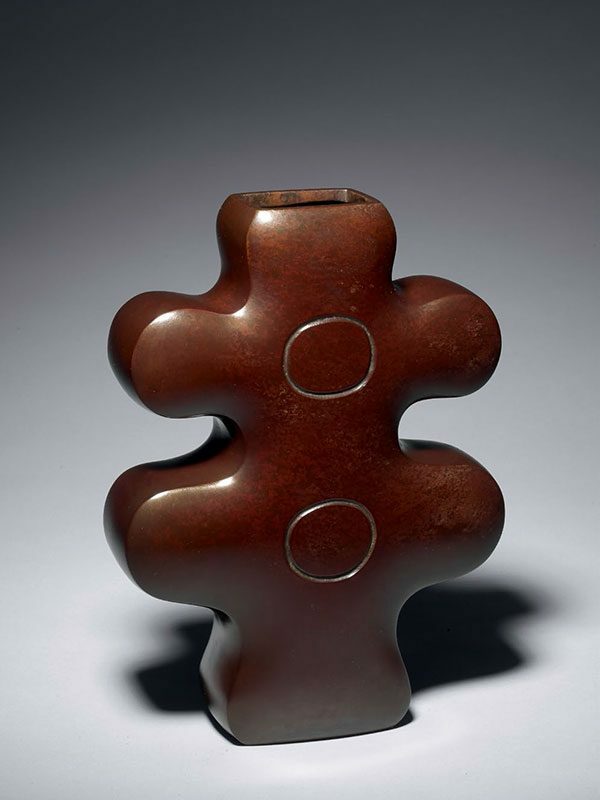 The prolific Osaka-born bronze artist Nakajima Mitsuo (1905 – 1986) came from a family of metal craftsmen and adopted the name Yasumi II as his go or art name, in order to distinguish himself from his father Yasumi I. Yasumi II was a member of the All Japan Decorative Art Association and regularly exhibited at the annual Japan art exhibition Nitten, where he was awarded several prizes. Nakajima Mitsuo was honoured as a person of merit within the field of crafts by his home prefecture Osaka in 1969. He continued to work, also exhibiting with his son Nakajima Junji, the third generation, who is still active in the field of metal crafts today. This elegant vase is a fine example of the revolutionary modernist style of which Yasumi II was such an exponent.